It was in a corner of this workshop, a corner that was given to him by his disbelieving father, that Joseph Opinel developed his closing knife. Daniel Opinel believed in the craft of edge-tool making above everything because making tools was serious work. Of course, to keep customers happy, sometimes you could "knock together" a few pocket knives. But was there really a future in manufacturing them? Joseph thought so. 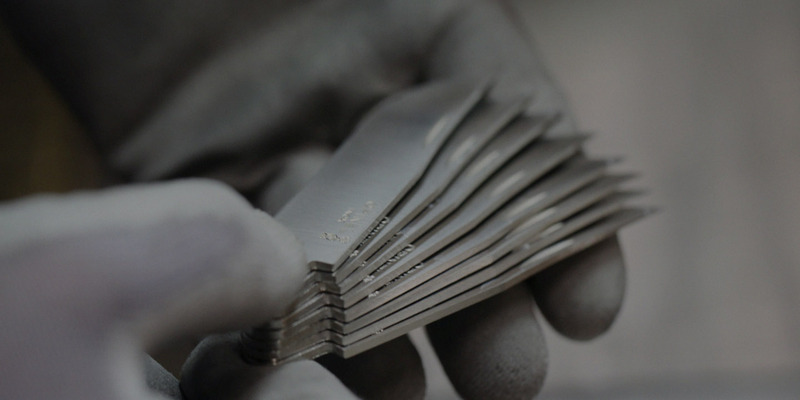 In knife making, there is no ideal steel but a multitude of grades that are suited to different knife purposes. By definition, steel is an alloy combining iron and carbon. When no other element is added, it is commonly called carbon steel. However, this grade is very sensitive to oxidation. To compensate, at least 10.5% or more chromium is added. This steel is generically known as stainless steel. The added chromium creates a superficial and extremely thin oxide layer, called a passivation layer which protects the blade from corrosion. The higher the carbon content in steel, the harder it gets through heat treatment. 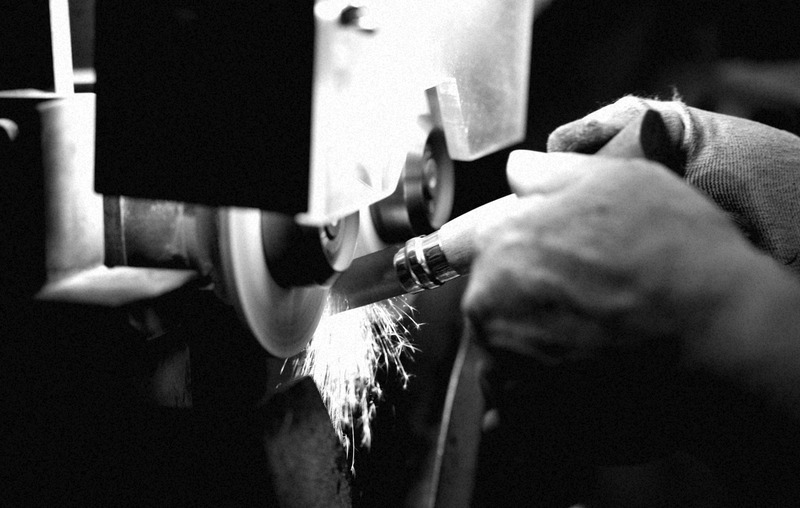 Hardness guarantees a long-wearing cutting quality. It is therefore quite tempting to use a high carbon content grade. The harder the blade, the more fragile it becomes. This is true for both types of steel, whether it is carbon steel or stainless steel. A high carbon content in stainless steel reduces its resistance to corrosion. Carbon tends to combine with chromium to form chromium carbides. As a carbide, chromium loses its protective properties against oxidation. It is important to note that, for a similar hardness, a stainless steel containing chromium carbides will be more resistant to abrasion. This property ensures long-wearing cutting quality. We aim for 57 to 59 HRC for our blades. Selecting a steel grade is always a compromise between mechanical strength and resistance to corrosion. Opinel's years of experience and expertise in the field has led us to choose two main grades. Selecting a steel grade is always a compromise between mechanical strength and resistance to corrosion. 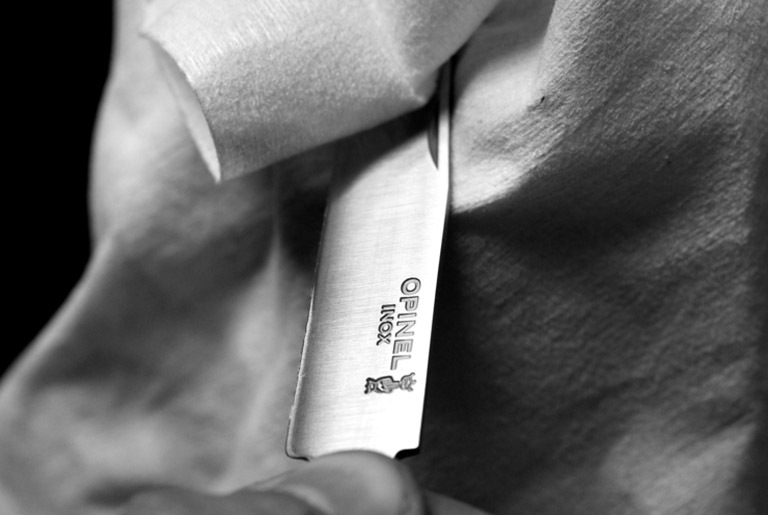 Opinel's years of experience and expertise in the field has led us to choose two main grades. 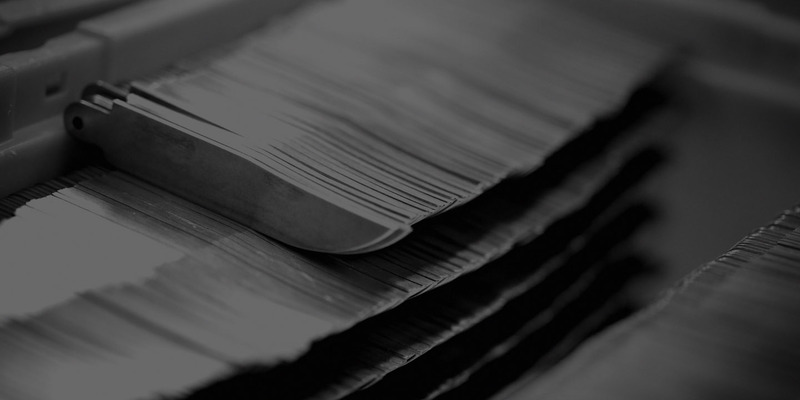 Heat treatment is one of the key steps to the quality of a blade and is critical in obtaining the required mechanical characteristics. 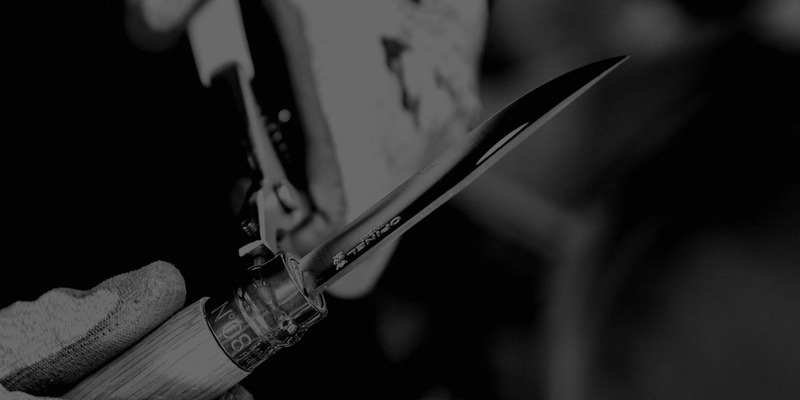 When it was first invented, the OPINEL blade was made of carbon steel. We still use a similar grade today, with an approximate carbon content of 0.90% which still has advantages over stainless steel. 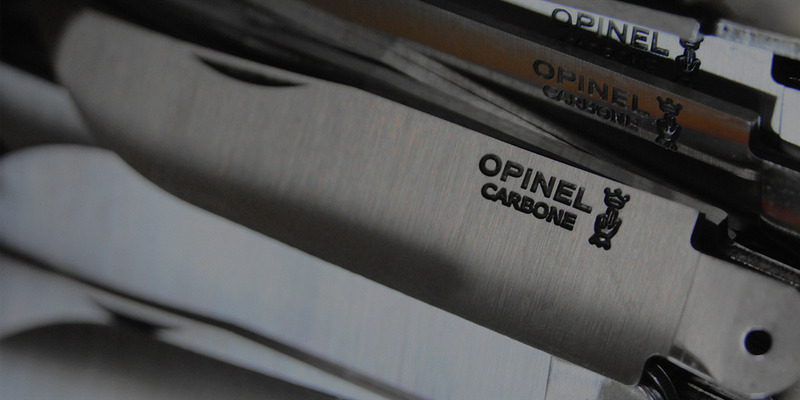 Our carbon steel begins the production process in Germany and is finished in France before being worked by OPINEL. This grade can be resharpened very easily, so with regular maintenance, its cutting power stays perfect. When cutting a soft abrasive material such as wood, paper or cardboard, the cutting edge gets worn and tends to resharpen naturally when in contact with this soft material. On the other hand, the cutting edge deteriorates more easily when in contact with hard surfaces such as ceramic plates. This grade is also cheaper than stainless steel. A carbon steel blade is more sensitive to corrosion and requires more maintenance than a stainless steel blade. It should not be used in a damp or acidic environment. Stainless steel appeared in the forms that we recognise now at the beginning of the 20th century. The stainless steel grade for OPINEL blades has been optimised to get the best compromise between resistance to corrosion and mechanical strength properties. Its carbon and chromium content are respectively 0.5 and 14.5%. 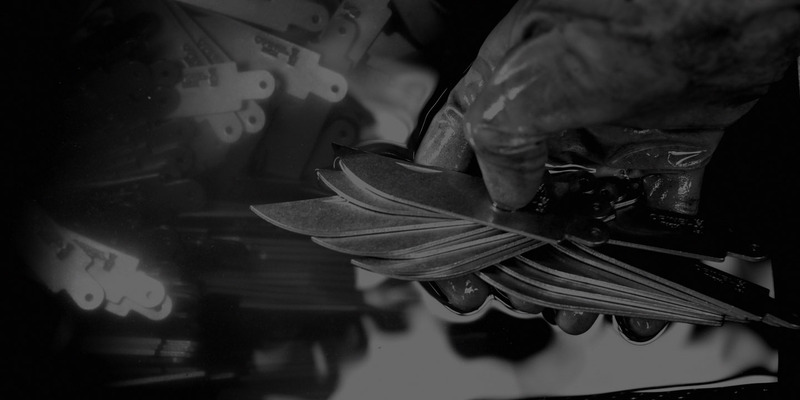 Our 12C27MOD stainless steel is produced and finished off in Sweden by the SANDVIK group, who are internationally famous within the knife making trade. This grade provides strong resistance to abrasion (wear) which allows the blade to be regularly in contact with hard materials such as ceramics, without needing to be resharpened. However, this sharpening requires specific expertise and the appropriate tools. Another advantage of stainless steel is that it requires no specific maintenance under normal conditions of use, unlike carbon steel. Nevertheless, it may be pushed over its limits when exposed to prolonged contact with an aggressive environment (acid, salty water, detergents, etc.). Steel is worked when “annealed”, i.e. when its hardness is very low. To reach this stage, the blade is subjected to a two-phase heat hardening treatment. The first step is called “quenching” and involves heating the blade to temperatures above 800°C before being cooled rapidly. The blade becomes extremely hard but also too brittle. The additional process is called “tempering” where the blade is heated again to a lower temperature than previously then cooled slowly. The convex profile of the OPINEL blade provides greater resistance to cutting when compared to a flat ground blade of similar height and spine thickness. The contact between the sides of the blade and the cut material is minimised which significantly reduces friction and therefore the cutting power required. The sharpening angle is also a compromise. If the angle is too sharp, the cutting edge is fragile and wears rapidly. The sharpening angle is also a compromise. If the angle is too sharp, the cutting edge is fragile and wears rapidly. If it is too obtuse, the cutting becomes too difficult. The OPINEL sharpening angle is approximately 40°. 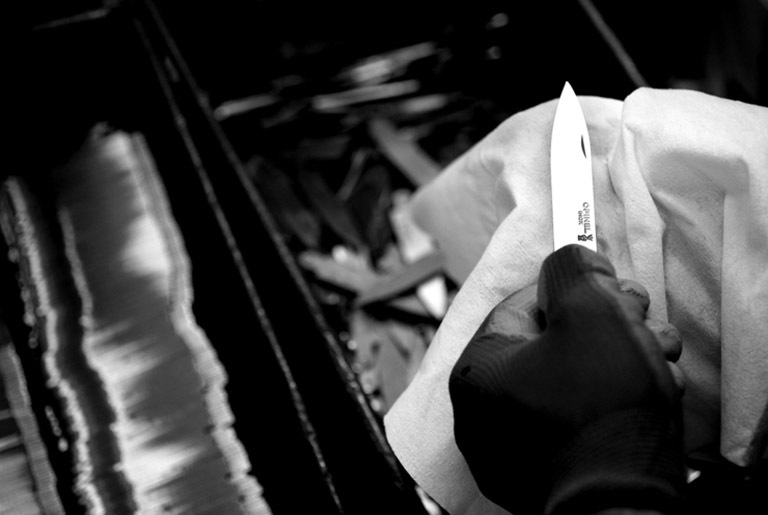 The sharpening operation is the last step in the knife manufacturing process. The blade is hand-sharpened using grindstones for which the precision in diameter is to the 1/100 mm in order to guarantee a regular cutting angle. 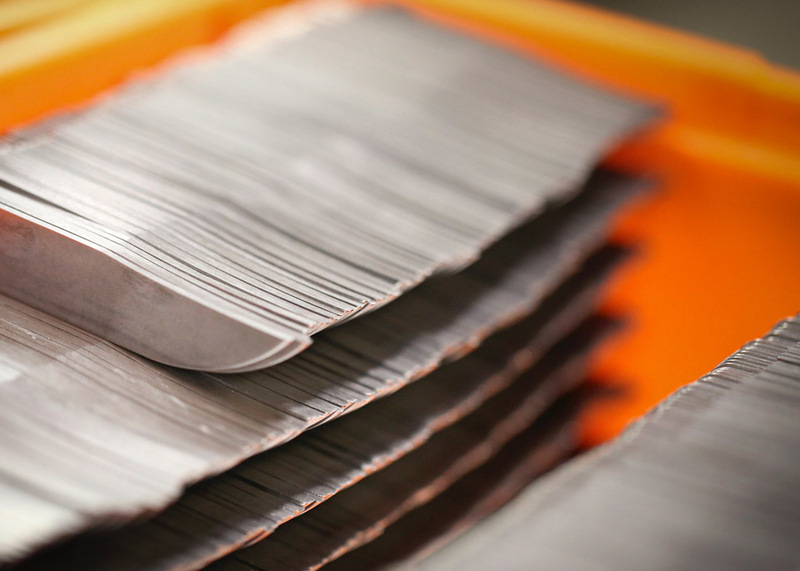 The different steels we use for the manufacture of our blades, whether carbon or stainless steel, are suitable for contact with food. 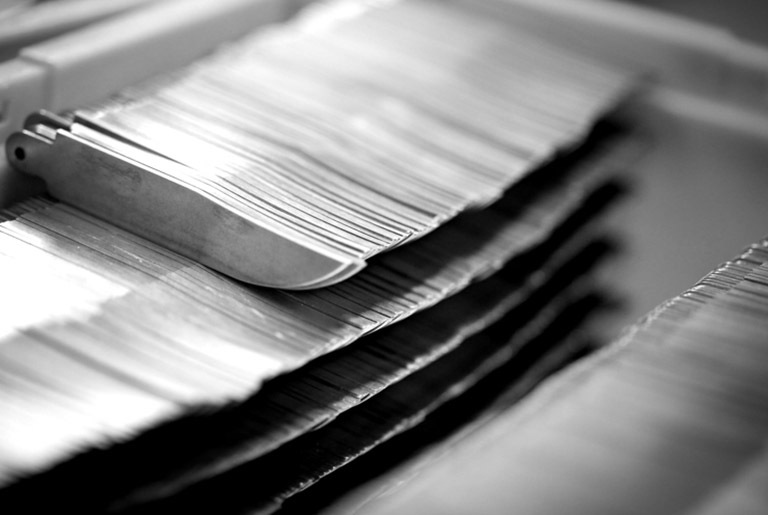 The different steels we use for the manufacture of our blades, whether carbon or stainless steel, are suitable for contact with food. Samples are regularly taken during production by an official organisation for analysis and to check their compliance with various standards. - EC 1935/2004 Regulation dated 27/10/2004 on materials and articles intended to come into contact with foodstuffs. The shape of the traditional Opinel knife has remained unchanged since its design by Joseph Opinel in 1890. The knife's wooden haft features a deep groove. Only highly durable wood is suitable for shaping and producing hard-wearing hafts. For this reason, beech wood, locally called “fayard”, is mostly used. Its grain is fine and homogeneous, providing excellent mechanical strength. Noble woods are used for certain ranges such as olive, oak, walnut or boxwood... Birch and hornbeam are light woods with fewer veins which are used for coloured hafts. Wood is a living material which will adapt and react to its environment. It expands and shrinks depending on moisture levels in air. When exposed to direct sunlight, its colour will become lighter or darker. Furthermore, the appearance of the wood may change drastically from one tree to another within the same variety. Therefore each haft is unique for its tone, veining and knots. Because OPINEL wants to avoid negative environmental impact, we use wood from local sustainably managed forests. 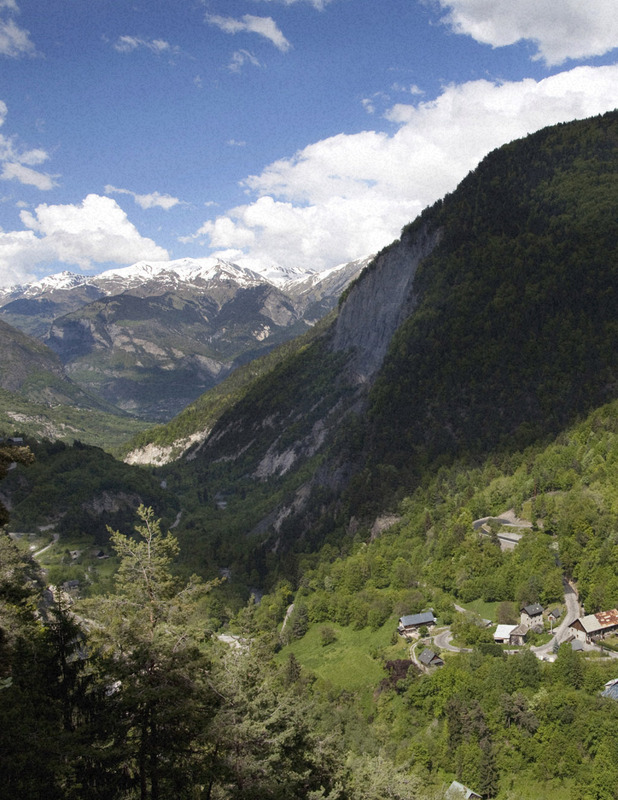 So our main wood supplier for Opinel knife manufacture is based in the Jura region. To protect our hafts from external wear, there are two available finishes: buffing and varnishing. Hafts shaped from rare and precious tree species are buffed with wax applied with a cotton disk. For every other wood, we apply a varnish which has been selected for its highly protective properties against moisture and staining. The varnish is tinted for the carbon range and clear for all the other ranges To create coloured hafts, we first apply a water-based wood stain before the varnish. To clean wood hafts, we advise you to use a sponge or a clean cloth moistened with some warm water (20°C), then to wipe it off immediately with a dry cloth. You should absolutely avoid running it under water and letting water penetrate into the groove, as this will make the haft warp. To maintain your horn haft, we strongly recommend you not to apply any products to it, as a simple, clean microfibre style cloth is all you need to buff the haft. If there are any small cracks, you can wipe the haft with a clean, soft cloth using a few drops of vaseline oil, but this treatment should be sparingly used. We advise you to avoid contact with any hot water, cold water or any sudden change in the temperature from heat to cold, or sudden atmospheric humidity changes from humid to dry. The fixed ferrule was needed to firmly rivet the blade to the haft. 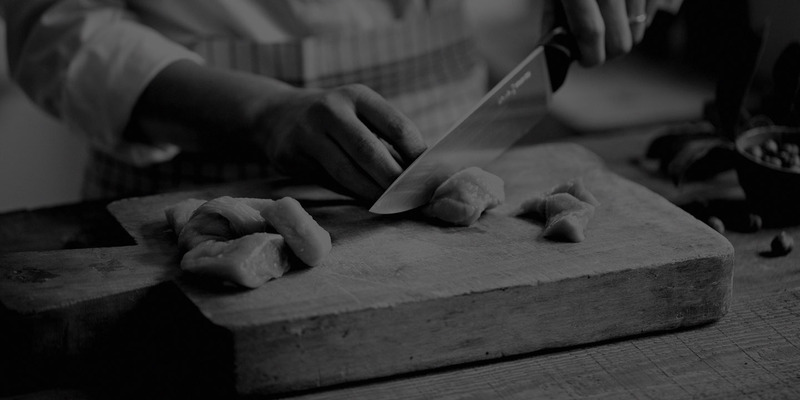 In 1955, Marcel Opinel, who had been working on improving the safety of the knife, invented the Virobloc® system. He added a rotating ferrule which slid onto the fixed ferrule, closing the groove and thus locking the blade in the open position. The idea was simple enough but hard to achieve. Conical shape, balance between steel strength and elasticity, changes in size due to the wooden haft and the rivet... A real challenge! In the 90s the Virobloc® system was modified to lock the blade in the closed position. At first. it was only used on a few models, but then was included on all models in 2000.